No one thing should define any human being. 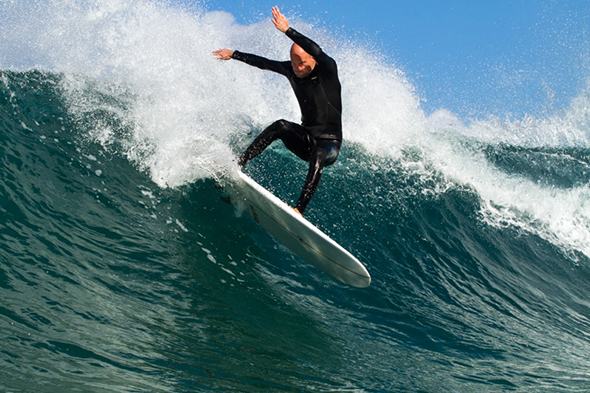 But if you had to choose what incarnates Shawn Zappo, surfing and yoga would be high on the list. The former Anchor contributor, who now writes for the San Francisco based surfandabide.com, combined both of these passions on a recent surfing adventure along the west coast of California. 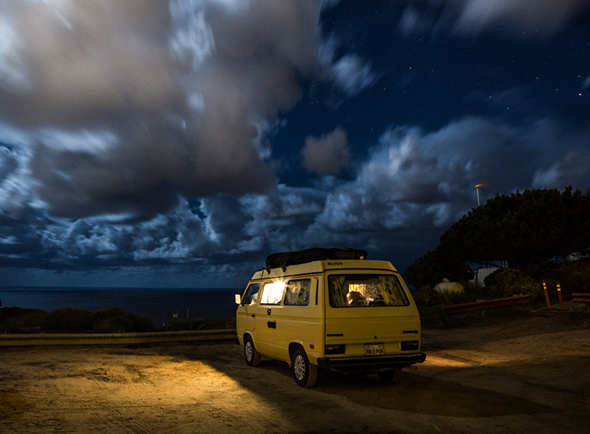 The trip was photographed by another past Anchor contributor Christor Lukasiewicz. Most of their days were filled with surfing, yoga, meditation and Kirtan (Indian Musical Chanting/Prayer). 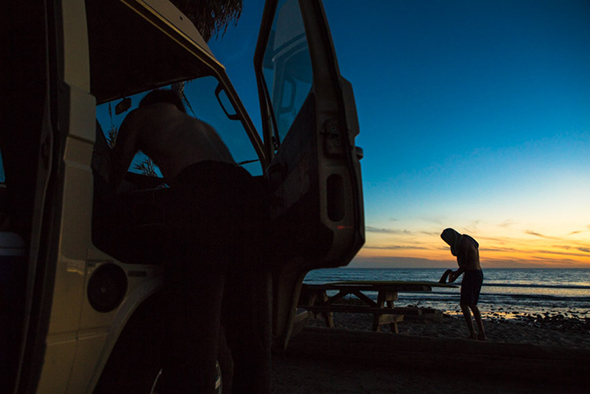 The guys traveled by way of a Volkswagen van visiting various surf spots, temples and yoga studios along the way. They met a ton of interesting people while on the road including Manny Caro of Mandala Surfboards who became a quick friend and who will be lending some writing and illustration to the project. It’s always the people you cross paths with who make any trip worth while. ANCHOR: So how did this whole west coast adventure come to be? ZAPPO: I met with Swami B.G. Narasingha, a.k.a. the “Surfing Swami” early in the year, and we had numerous discussions about me taking on the monumental task of writing his biography. After a good amount of thought, I felt I wasn’t yet prepared to take on such a colossal piece of work. The Swami also began to express that he wasn’t quite ready himself, as he felt the next ten years would hold some of his most powerful works in the world. We came to another conclusion that was equally beneficial for both of us and could happen in the near future. The plan is that I will be traveling to India this upcoming summer, working on a book that will feature a good amount of photo work by photographer Christor Lukasiweicz, coupled with essay-style written work by the Swami and myself. As excited as I am about this opportunity, I am also nervous to be completely honest, so I felt I could do some training, so to speak, before the India trip. The west coast adventure or “Surfing Sadhana” tour was born out of both the push of friends, readers, and the Surfing Swami’s direction to write, as well as the upcoming project in India. I thought to put the format we will be using in India to the test, we could travel to California, escape the cold for a bit, connect with friends and mentors out there, score some fun surf, and see if the concept actually worked. 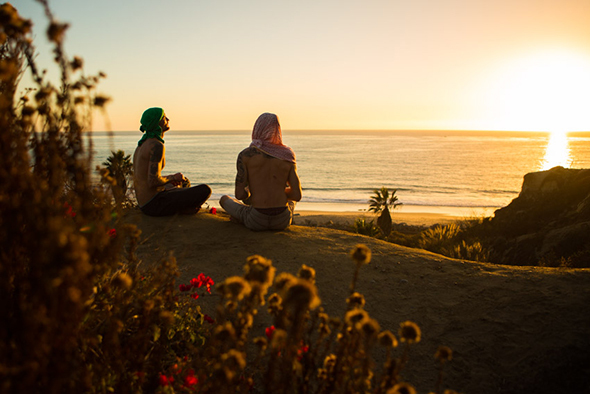 So with the funding and backing of Surf and Abide, Stephen Triolo, Christor Lukasiweicz, and I made the trip out west for two weeks to document the practice of surfing, yoga, and meditation while traveling the southern California coastline. The book will expand on and immerse readers deeper into what has been my prime writing focus of the past few years, the concept of surfing as a spiritual or Yogic path. Through the written word, I go to lengths to present surfing beyond its reduction into a sport and a commodity, getting closer to the heart and soul of the practice. I personally feel it is a bona fide way to directly commune with nature or the divine, and I enjoy sharing this perspective with other human beings. The word “sadhana” means a mode of practice towards a goal of spiritual or self-realization. Our California trip focused on this concept and the finished work will be the “Surfing Sadhana” book. ANCHOR: Tell me about the trip start to finish? Did you drive cross country or did the journey start out West? What kind of van were you in? How long were you traveling? Where did the trip begin and what were the spots you hit along the way up north? ZAPPO: We had a time frame of two weeks to complete the trip, which now after the trip, I’ve come to realize isn’t very much time at all. We didn’t drive cross country, we flew into John Wayne airport and then we picked up our van for road travel and camping. We had worked out a sponsorship deal with Bill from Vintage Surfari Wagons in Costa Mesa, CA. Bill hooked us up with a beautiful 1982 VW Vanagon Westfalia pop-top named “Hale Pua” as our mode of transportation and our living quarters for our journey. With two weeks traveling time, an itinerary to follow, and needing to catch the swells, most of our trip was spent in the Southern California region as that was where the surf was best. We surfed a good amount of spots, but certainly scored the best waves at Trestles, Scripps, and Imperial Beach. We had plans to hit the Santa Barbara area, but with no real swell making its way up there, we spent our time surfing between San Clemente and Imperial Beach. ANCHOR: Tell me about some of your meditation experiences. ZAPPO: When people hear the word meditation, they tend to think of Buddhist breathing meditation or something like that. So in that type of meditation practice, you normally sit cross legged, eyes are closed, and you focus on your breathing. During this practice, the mind tends to wander and all kinds of wacky thoughts appear out of nowhere. When this happens, you acknowledge the thought, let it pass by, and bring your attention back to your breathing. Although we did do some breathing meditation, this wasn’t a huge focus for us. We did engage in other forms of meditation, namely mantra meditation. The word “mantra” means sound vibration which liberates the mind. We had Kirtan, which is the group chanting of certain mantras or prayers with musical instruments. Kirtan is nice because it engages so many of your senses, making it easier to focus, and it’s just fun to make music and vibe out. We also practiced Japa meditation which is the soft chanting of mantras on mala beads. I personally find Kirtan very engaging, the Japa meditation is a bit difficult for me, as it’s not as engrossing. Ultimately there are numerous forms of meditation. When I speak of meditation, I’m describing the practice of one-pointed focus or being totally present in the moment. Totally present in the “now”. You can meditate doing just about any activity, you only need to be fully present, fully attentive in what you are doing. So going back to surfing as a spiritual practice, surfing is a meditation, and personally some of my most profound experiences with meditation take place during surfing. Beyond the act of surfing, I found some of the most beautiful things I gave my true attention to were our natural surroundings. What really comes to mind are the groups of pelicans that would fly by. They glide with such ease and precision. They are a great example of style, grace, and skill, without an ounce of pretense. 100% natural! ANCHOR: What were the temples you visited like? Architecturally and spiritually speaking? ZAPPO: We visited two Hare Krsna temples, one in Laguna Beach and one in Pacific Beach. I would have liked to check out the L.A. temple, as I heard it’s like the Brooklyn temple was in the 90s, but we didn’t have time to get there. In any event, the Hare Krsna temples are something I’m familiar with as I began going to the Brooklyn temple when I was about 16 years old. I also bounced in and out of that temple trying to live as a monk in the early 90s. The Laguna temple is always a nice spot to check out. A lot of people were there when we visited. You had young people, surfers, hippies, yogis, and the like, as well as a lot of temple elders and Indian families. A real nice mix of people and kind hospitality. It’s only a block from the ocean and you really feel those vibrations there-something more relaxed and connected to natural rhythms of the sea. Pacific Beach temple seems to have a small following, mostly young celibate monks live there. That temple featured some cool architecture in the temple room. Various engravings and carvings on the walls and bases of pillars that the deities sat upon. Spiritually speaking, the Hare Krsna movement is that of Bhakti Yoga. Bhakti means the path of love and devotion to the divine or Krsna. The main practices are studying holy texts like the Bhagavad Gita, as well as engaging in Kirtan and Japa meditation. ANCHOR: Can you explain some of the parallel connections between surfing, yoga and meditation? ZAPPO: I think the first way to draw the parallels between these things is to give them simple definitions. 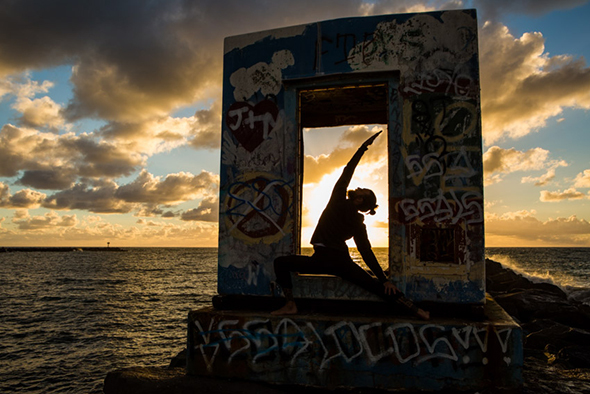 Yoga is a practice and path followed to connect or bind one to the higher self, the divine, or God. There are a variety of yogic paths as described in the Bhagavad Gita. But essentially Yoga is a means to bind one to the divine through personal realization and revelation. Meditation also comes in a variety of styles, yet I feel the essential goal is to be fixed in the moment with superior focus, without being dragged away by thoughts of the past or future, or this or that. It is one-pointed focus on what is or as Ram Das has said, “BE HERE NOW”. This is my understanding of meditation. Surfing can be both Yoga and meditation for the practitioner, it really depends on the consciousness of the surfer. When we open our hearts to the total experience of surfing, we cannot avoid having an interface with the divine. So when I say surfing is a Yogic path, in a traditional sense many people will strongly disagree with such a claim. Yet based on my experience, I have had my closest connection to what I would call divinity through the act of riding waves and being in the ocean. Similarly I have entered into the deepest states of one-pointed focus or meditation while riding waves. Surfing calls up what I would call a non-minded focus or meditation. The mind and all its thinking needs to take a back seat, and as we enter into a state of deep unobstructed focus or meditation, that is when the best surfing happens. Spontaneous, pure, and flowing. ANCHOR: Best surf spot along the way? 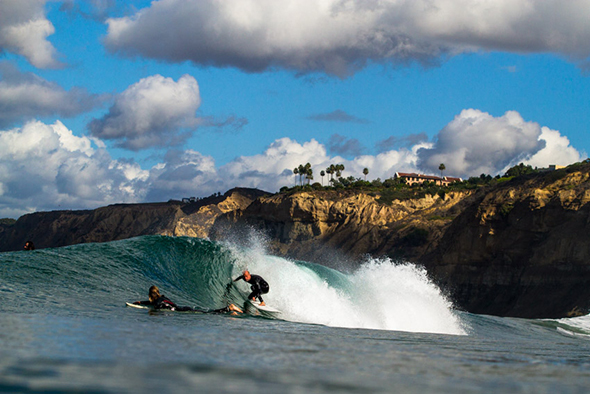 ZAPPO: The best day of surf we scored was at Scripps. Offshore winds, super clean water, and a nice-sized swell with plenty of waves coming through. The take offs were nice so you could really draw a proper bottom turn and line, then as the wave hit the sand bar, there were some hollow wedges to be had. There were a lot of surfers in the water, crowded for sure, but there were enough waves for everyone, and the stoke level was high. ZAPPO: I’ve been talking a lot about the moment, or being focused and fully present in the moment, yet I cannot give you one best “spiritual” moment. It’s my understanding that we are spiritual by nature, although our bodies are temporary, the energy which animates the body is eternal. So I hold the belief that at our essence we are eternal life-force energy, beyond the body and mind. That said, our entire life is spiritual, but once again it is a question of our consciousness and our willingness to open our hearts to that level of experience. I struggle with this all the time in the variety of situations I encounter in my daily life. I will say that I felt a good amount of stress on the trip, trying to keep to the schedule, and staying organized. I became very aware of my attachment to the fruits of my labor and my inability to go with the flow when it’s needed most. So I posses many qualities that would be considered less than spiritual by most. Yet I also felt a powerful level of gratitude to be on the trip and to share it with my lifelong friend Steve. In fact, now that I’m thinking about it, the most memorable moment of the trip was on our final day before leaving. Steve and I went swimming at Calafia and upon entering the water, we thanked one another for the journey. That recognition and expression of gratitude between friends was the most spiritual moment. That’s it! ANCHOR: When will the book be available and where will people be able to get it? ZAPPO: We are in the writing process at the moment. I don’t write or even take notes on the road, I like to take it in and digest it. After the digestion process, I’m ready to put it down in written word. I’m writing the bulk of the content, Stephen Triolo will be writing content, and Manny Caro from Mandala Surfboards will write some content, as well as drawing art for the book. I’m guessing the writing process will be finalized within the next two months and then we will work on the layout with the written work, photos, and art. After that is the actual production of the book, which will be done by girlfriend’s brother’s publishing company Container Corps. So at the moment we have no hard deadline for the book, but I’m imagining spring or early summer 2015. As far as availability, you will be able to score the book at www.surfandabide.com and at your local surf shop that leans more towards the fringe elements of surf culture. There will also be a book tour of sorts in order for the release, so I imagine we’ll sell a good amount of books at those events as well. To keep updated on the progress of the “Surfing Sadhana” book, visit www.surfandabide.com. Check out more of Christor Lukasiewicz’s work here. 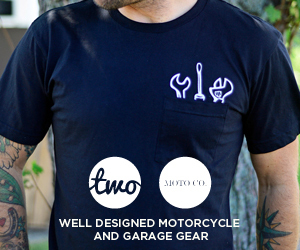 This entry was posted on Thursday, December 4th, 2014 at 11:55 am. It is filed under SURF. You can follow any responses to this entry through the RSS 2.0 feed.